A few people have asked me if I'd consider selling coffee sleeves like the ones that I made as prizes for the 5K. Normally, I don't advertise that I make things for sale, because I don't want it to feel like a "job" that I have to do--then I would probably stop enjoying it. But if you e-mail me and ask me for what you'd like, more than likely, I will be happy to work something out. But honestly, you would probably be better off buying them somewhere else online, like Etsy, because I'm pretty expensive ;) My time is worth more to me than anything, and handmade items take a lot of time to make. 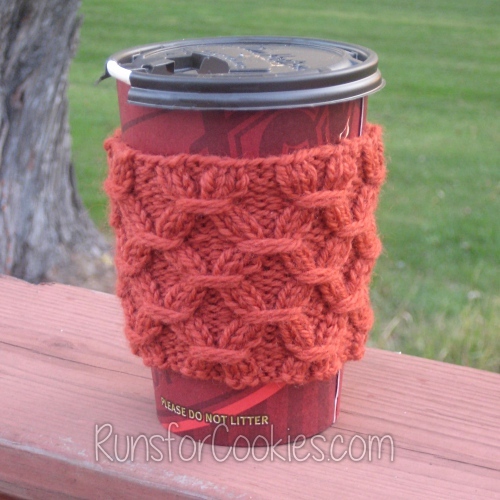 For the coffee sleeves, I would charge about $15 each. The notebook covers would be about the same. (And that would include shipping). So feel free to e-mail me if you'd really like something. And as an alternative, if you know how to knit or crochet, you can always make your own! My pattern notes can be found on Ravelry, and my username is MyFairKatie. I don't use Ravelry much at all anymore, but once in a while I do. 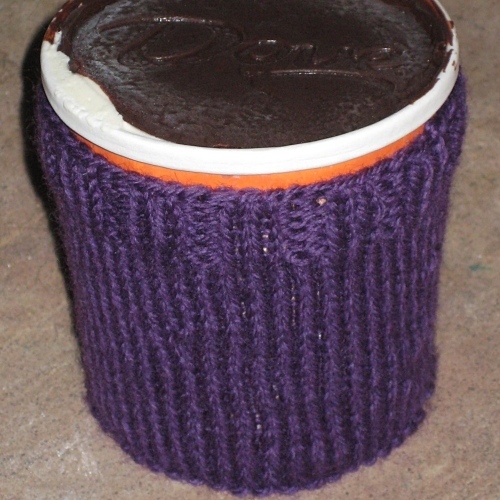 That would be an ice cream pint cozy--I ate so much ice cream that I felt the need to make a cozy for it! I used to eat ice cream by the pint many times a week before I lost the weight--so much so that I required a cozy to keep my hands from freezing. Hahaha! I remember throwing that cozy away after I'd lost about 50 pounds. (That Dove ice cream was the best! It had a layer of chocolate ganache on top). All this craft talk reminded me that I promised some of you a tutorial for the book covers! I took all the pictures, I just have to write up the post. Will do that soon. That's 1.5 up from last week. My first gain since September. I still followed my WW PointsPlus, and counted everything, but for some reason, my weight is up. It was weird--one day, it was 131, the next day, it was 132.5, so I thought it was probably from eating extra sodium or something. But I've been hanging out at 132.5 all week long, so who knows. I think what probably happened is that while I was in Florida, I was being very active--walking all over the place--and eating really well. I was so worried about gaining weight that I was extra cautious. I also didn't eat much fruit--when I'm at home, I eat a ton of fruit, but it was uber-expensive in Key West, so I (sadly) didn't eat it. Anyway, I lost a couple of pounds, bringing me to 131, two pounds below my goal weight. Now that I've been back to my normal routine for a while, maybe my body is just getting readjusted back to my goal weight. Regardless, I'm not upset about the gain in the slightest, because I did everything right, and even at 132.5, I'm still a half-pound below my goal weight. Tomorrow I have my weigh-in at Weight Watchers, and I'm starting to hate weighing in there. The receptionists always comment something like, "You stayed exactly the same as last week. Well, at least you didn't gain." I want to yell, "I'm in MAINTENANCE! That means I'm HAPPY to maintain!" I know they mean well, but I wish they would be happy for me when I maintain, instead of giving me the sympathetic look. Last chance to sign up for the Virtual 5K on Friday! Here is the post where you go to sign up. Remember, you can run OR walk, and using the treadmill instead of going outside counts, too. There is no such thing as being "too slow" to do it! I was checking out your patterns and I'm impressed! I am a sucky crocheter!! I LOVE the swiffer pattern! I'm SO making that tonight! What a great idea!! I NEVER would have thought of that! Looking forward to the tutorial on the book covers!! I'm thinking I might try to make the running skirt once I get a few bucks for fabric - I have a pair of running tights that are a little snugger than I'm ready to wear in public, if I made the skirt long enough - it wouldn't matter. HAHAHA They are my only non capri pants - it's stinking COLD outside! Seriously- all I am thinking of now is that chocolate ganache! Lol... I wish I could knit- sooo not good at anything like that!! Great job at maintaining. Maybe your body is just perfect at 132.5. and wants to hang there! I wish I had that talent. Definitely take advantage of it! Good idea for your kids teacher's gifts! Next time you get the sympathetic "at least you didn't gain" please please please just say with a big grin "I'm in maintenance! I'm exactly where I want to be" and put them in their place with a smile. How annoying that they're not celebrating maintenance with you. I am so glad I do weight watchers online! Seriously if i went to weigh in and they treated me that way id go off! I lack the self sensor part of my brain thankfully and usually just tell folks just how i feel. Also, im totally gonna make a pint cozy! I get the yoplait frozen yogurt pints when im really craving ice cream cause i can have the whole pint for between 8 and 9 points..( i do the old version of WW ) and its totally worth those 8 or 9 when you must have a pint! They have peach, strawberry, and banana strawberry and every flavor is amazing! Hey, can I put a picture of 'me' in my blog with your bib on? Gotta get to the library today to print my bib! Katie, I agree with the others you should respond to their "at least you didn't gain" comment by reminding them you are in maintenance. You deserve the credit and applause of losing and maintaining your weight. I'm super excited for tomorrow's 5k! Happy Birthday Eve!! Although I can't run due to my back injury, I WILL run your virtual 5k once I can run again. It'll just be a little late. But it will be in honor of you for being so inspiring. Thanks, Katie! I would be so annoyed by those comments at weight watchers and would definitely speak up after a time or two of dealing with that nonsense! Hi Katie-When I went to WW, the last time, i finally said to whoever was weighing me in, please-no comments, just say OK and put the sticker in the book. I had a hard time dealing with whatever their spin was on things and getting weighed. You are doing great. You are my hero! Thank you for taking the time to share your journey! I purchased 2 years for under $12. Great for those of us on a budget. I never would have thought of running but you have inspired me this past year reading your posts each day. Thanks so much for sharing!